At the end of the accounting period, usually right after the last day of the year, 31 December, businesses will close their accounts – tallying up the results for the year to see what the year’s performance was like. At this stage, all transactions/journal entries have been entered into the various accounts. Refresh your memory on how journal entries are posted to the accounts. Go to Posting Journal Entries. Before the accounts can be finally closed, they need to go through an adjusting process – in other words, they need to be updated. The journal entries that bring the accounts up to date at the end of the accounting period are called adjusting entries. Prepaid expenses are the advance payment of future expenses. For instance, rent is usually prepaid in advance before a business occupies a property. At the outset, the business has not yet “enjoyed” the occupation of the property, but has paid the rent for the said occupation. Therefore, there is a mismatch between rent payment and physical occupation/utilization of the space rented. In the accounting world, the advance rent paid cannot be initially recognized as an expense, but is instead recorded as an asset. However, at the end of the accounting period, a portion (if not all) of the prepaid rent may have been utilized. Under such circumstances, that portion would need to be charged out to expenses. This can apply to prepaid supplies (which will be eventually used up), prepaid insurance (the coverage of which will be eventually utilized) and prepaid utilities, such as electricity and water. ABC Enterprises’ supplies account has a balance of $2,000 on the unadjusted trial balance. Some of these supplies have been used during the period. On December 31, a count reveals that the amount of supplies on hand is $760. Supplies used ($2,000 - $760). To refresh your memory on Double Entries, click here. The debit balance of $2,400 in ABC Enterprises’ prepaid insurance account represents the December 1 prepayment of insurance for 12 months. Hence, for the year ended 31 December, 1 month’s worth of insurance has been utilized (1/12 X $2,400 = $200). Unearned revenues are the advance receipt of future revenues. An example is when a business receives cash for services yet to be provided, or for goods yet to be delivered. In other words, revenue has yet to be earned, but payment has already been received – this creates a mismatch. At the end of the accounting period (as with prepaid expenses above), a portion or all of this revenue may have been earned, which is then properly recognized as revenue. Another thing to note is that unearned revenues are part of liabilities, because until the revenue is actually EARNED, any cash received is considered payable back to the customer. The credit balance of $360 in ABC Enterprises’ unearned rent account represents the receipt of three months’ rent on December 1 for December, January, and February. At the end of December, one month’s rent has been earned. Accrued revenues are unrecorded revenues that have been earned, but cash has not yet been received. ABC Enterprises signed an agreement with Emerson Company on December 15 to provide services at a rate of $20 per hour. As of December 31, ABC had provided 25 hours of services. The revenue will be billed on January 15. Accrued fees ($25 hours x $20 per hour). 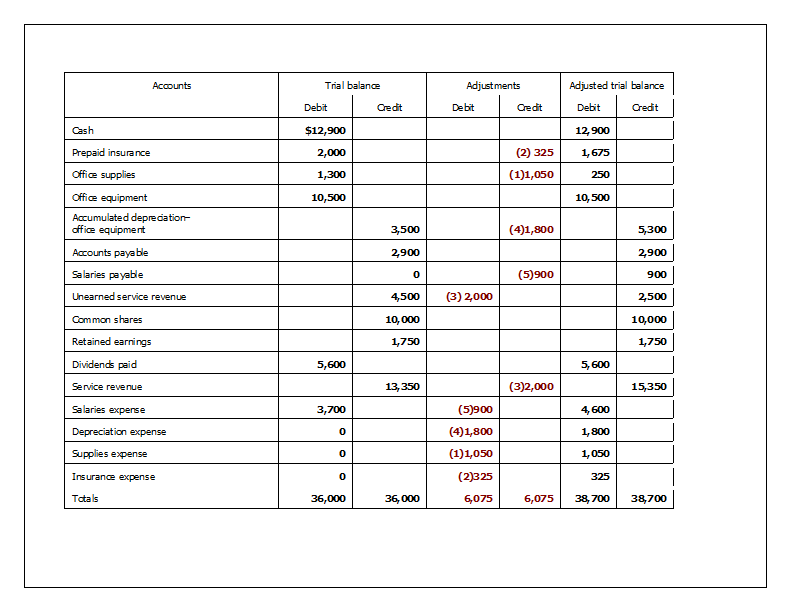 And finally, accrued expenses refer to unrecorded expenses that have been incurred, but cash has not yet been paid. Notice that they are the opposite of accrued revenues. ABC Enterprises pays its employees biweekly. During December, ABC paid wages of $950 on December 13 and $1,200 on December 27. As of December 31, ABC owes $250 of wages to employees for Monday and Tuesday, December 30 and 31. ABC Enterprises paid wages of $1,275 on January 10. This payment includes the $250 of accrued wages recorded on December 31. This is a particular category within accrued expenses that need special consideration. What is depreciation? Fixed assets, or plant assets, are physical resources that are owned and used by a business and are permanent or have a long life. As time passes, a fixed asset loses its ability to provide useful services. This decrease in usefulness is called depreciation. All fixed assets, except land, lose their usefulness and, thus, are said to depreciate. As a fixed asset depreciates, a portion of its cost should be recorded as an expense. This periodic expense is called depreciation expense, and is a usual adjusting entry at the accounting year end. ABC Enterprises estimates the depreciation on its office equipment to be $50 for the month of December. Notice that the fixed asset account is not decreased (credited) when making the related adjusting entry. This is because both the original cost of a fixed asset and the depreciation recorded since its purchase are reported on the balance sheet. Instead, an account entitled Accumulated Depreciation is increased (credited). The difference between the original cost of the office equipment and the balance in the accumulated depreciation—office equipment account is called the net book value. At the end of the adjustment process, the trial balance is updated with the adjusting entries accordingly. The adjusting entries are treated like any other journal entry before this – they are posted into the relevant accounts. The updated accounts will show final debit or credit balances, which are then extracted into the adjusted trial balance. This adjusted trial balance will be used to draft the financial statements – but that will be discussed in another section. There is a neat trick to make sure that the adjusted trial balance “balances”. In other words, the total of the balances on the debit side must equal to the total of the balances on the credit side. The trick is to use an adjusting worksheet. 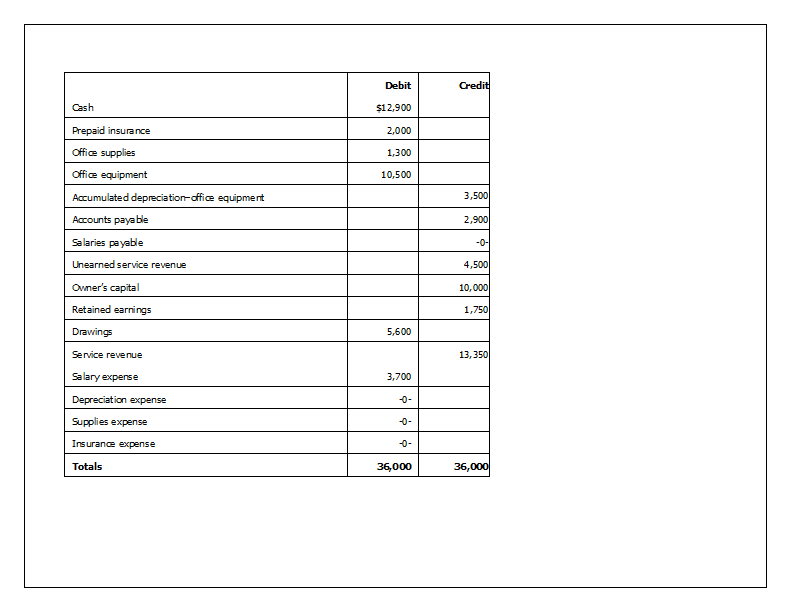 Verbatim Services Inc. has the following unadjusted balances at year-end. The following information is available to use in making adjusting entries. Therefore, the balance needs to be adjusted by: $1,300 - $250 = $1,050. Therefore, the balance needs to be adjusted by: $4,500 - $2,500 = $2,000. The debit/credit balances of the adjusted trial balance will be used to draft the final financial statements. Want to read about what happens after the trial balance is adjusted? Go to Drafting Financial Statements.